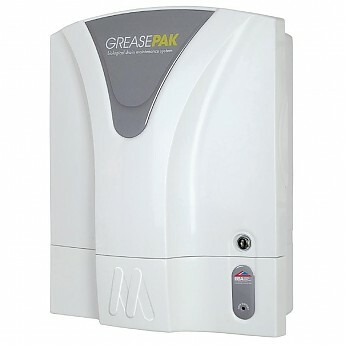 GreasePak is a CE certified biological drain maintenance system which releases a daily dose of bio-fluid into drains in order to degrade FOGS (Fats, Oil, and Grease).GreasePak complies with FOG removal laws such as BS EN1825, and benefits from a cost-effective and low maintenance refill procedure. The module is also classified under `Hazard Group 1', meaning that the naturally-occurring microorganisms within its bio fluid are not harmful in any way. Using the Greasepak module results in clearer drains which in turn creates better water efficiency, and a more pleasant scent around sinks and drains. There is also less risk of insect or rodent infestations and the population of beneficial bacteria is boosted downstream, continuing to break down waste effectively even after working through your plumbing. Within the GreasePak module, there are no floor drums or containers to be replaced, but instead a bio fluid pack can be quickly, safely and hygienically replaced, maintaining free-flowing drains and saving costs. It's also easy to clean, with only a disposable cloth and fresh water required. The wall-mounted GreasePak module is ideally used in busy kitchens and food preparation areas, blending easily into its surroundings with neutral colours.